It's almost Halloween again, and I can't wait. This year I've got invites to several places for Halloween and it's going to be hard to figure out how many places I can get to in a single evening. So I thought I would share a few ideas of fun things to make and bring if you're going to a Halloween party this year. 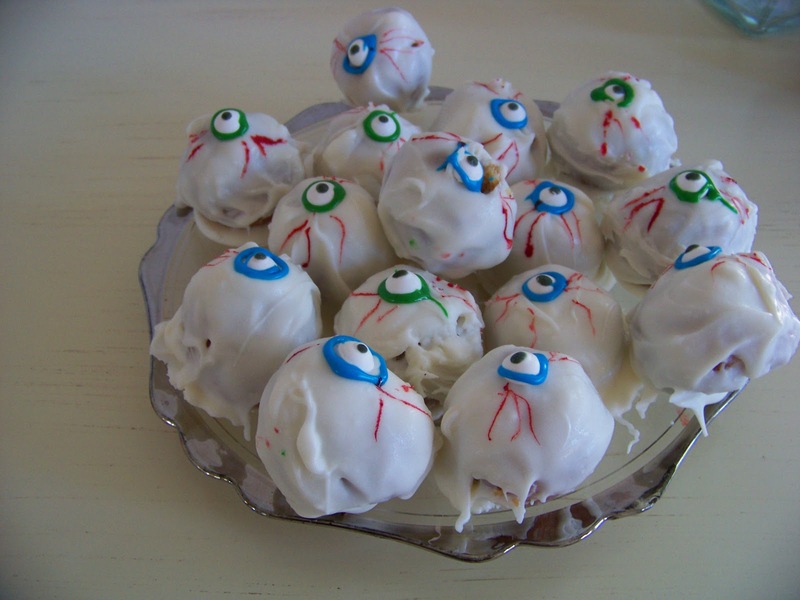 One of my all time faves, Eyeballs, so simple to make and fun to eat. All you really need is white chocolate for dipping, some red food coloring, some blue candies and oh yeah, the basis of the eyeball, a donut hole. Dip the doughnut hole in some white chocolate, let it drip off for a second or three, then place a blue or green candy in the middle, and draw some red lines around it with a toothpick dipped in red food coloring. 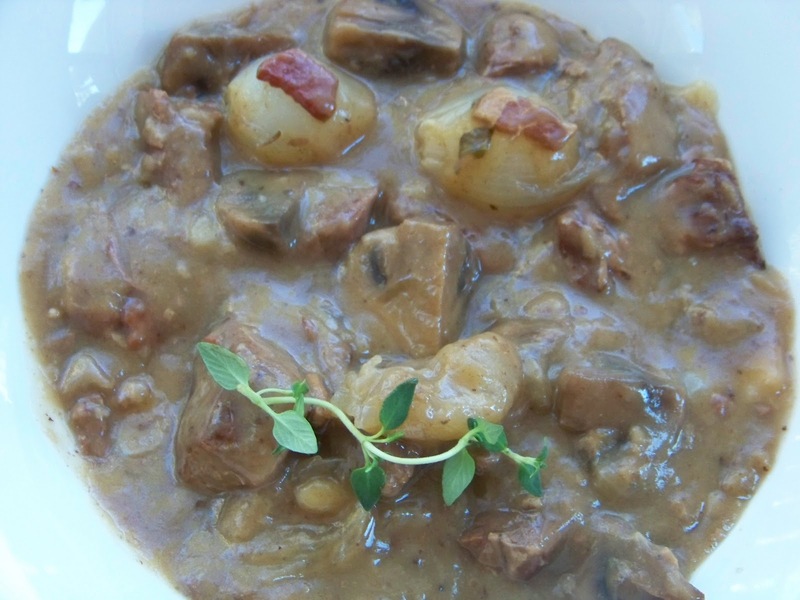 Simple, fun and delicious. Or how about some Mice? 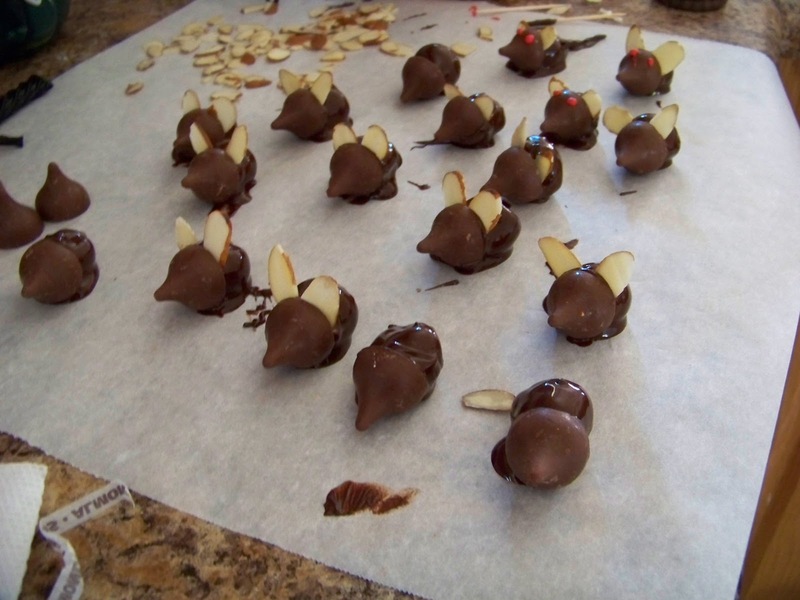 Get yourself some Hershey kisses, sliced almonds, marashino cherries with the stems on and some good dipping chocolate. 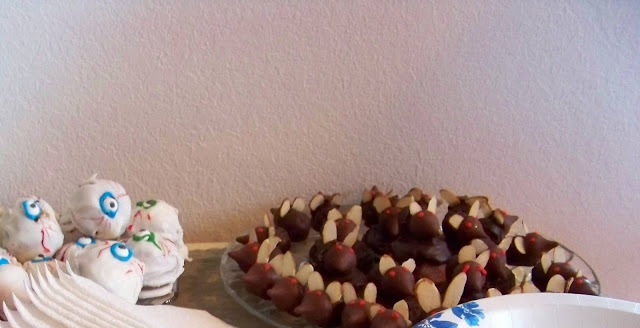 Dip the cherry in the melted chocolate, stick the Hershey kiss on the end and a couple of slices of almonds for the ears, and if you want a drop or two of red frosting for the eyes. Kids love this one. (and they taste good too). Last week a guest brought these Deviled Eggs decorated with black olive 'Spiders'. Decorate up a Bologna Cake with Halloween colors. Use the canned cheese for orange, make some spiders out of black olives to crawl over the cake, you use your imagination. Plus, it's just plain fun to go to a party with a pretty looking 'cake' and have people cut into it and get surprised that it's not a sweet at all. Onion and Mushroom Tart with Goat Cheese.